Home / 2012 / August / Amazon horror show: Eyelid tape, vajazzle, the infamous breast pillow and much more! For your viewing enjoyment we present you with a collection of horrors assembled from Amazon.com. The widget is on the right. Though Amazon may take some inspiration from the tribe of notoriously one-breasted women (Amazons) who enjoyed shooting arrows through the hearts of men, these products offer a different kind of sting– the sting of perfection!!! OUCH. “Fat Girl Slim” and “Fat Girl Sleep” (products that seem like commands you might give an animal) are our personal favorites. Though the flatulence deodorizing pads brought to our attention by a reader are also pretty amazing. 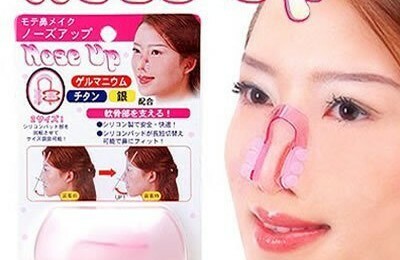 If you are worried about smells, you could just use the reshaping nose clips pictured above and never have to deal with unpleasant scents ever again. Do you have any products to add to this horrific list?